Nina Williams is one of the world’s strongest female boulderers and she recently had two major accomplishments in South Africa. 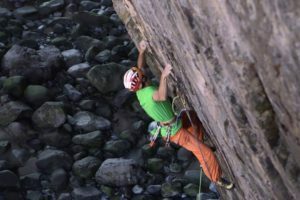 Having spent the better part of the summer at Rocklands in South Africa, Williams has sent a number of hard problems, the most difficult was Ray of Light. Not only is it Williams’ first V13, but it’s also the first female ascent of the Klem Loskot route in the Dihedral boulders. Here is a photo of Williams sending Ray of Light by Beau Kahler, be sure to visit Kahler’s Instagram from more great shots here. Williams also sent Nusa V11, Megos Line V11, Fred Nicole’s route La Gloire des Papous V11 and flashed a V10 called Stalker on the Horizon and sent No Late Tenders V10.